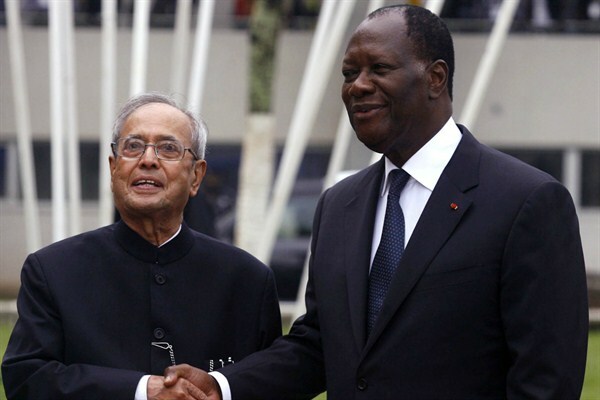 Indian President Pranab Mukherjee with Cote d'Ivoire President Alassane Ouattara, Ivory Coast, June 14, 2016 (AP photo by Diomande Bleblonde). Earlier this month, Indian President Pranab Mukherjee went on a six-day tour of Africa, visiting Ghana, Cote d’Ivoire and Namibia, where he announced new grant assistance and lines of credit as well as expanded scholarship opportunities. In an email interview, Amanda Lucey, a senior researcher at the Institute for Security Studies in Pretoria, discusses India’s outreach to Africa.